In the ancient Roman calendar, Quintilis or Quinctilis was the month following Junius (June) and preceding Sextilis (August). Quintilis is Latin for "fifth": it was the fifth month (quintilis mensis) in the earliest calendar attributed to Romulus, which began with Martius ("Mars' month," March) and had 10 months. After the calendar reform that produced a 12-month year, Quintilis became the seventh month, but retained its name. In 45 BC, Julius Caesar instituted a new calendar (the Julian calendar) that corrected astronomical discrepancies in the old. After his death in 44 BC, the month of Quintilis, his birth month, was renamed Julius in his honor, hence July. Quintilis was under the guardianship (tutela) of the Romans' supreme deity Jupiter, with sacrifices made particularly to Neptune and Apollo. Agricultural festivals directed at the harvest gradually lost their importance, and the month became dominated in urban Imperial Rome by the Ludi Apollinares, games (ludi) in honor of Apollo. Ten days of games were celebrated in honor of Julius Caesar at the end of the month. Like the modern month of July, this was one of the "long" months that had 31 days. The Romans did not number days of a month sequentially from the 1st through the last day. Instead, they counted back from the three fixed points of the month: the Nones (Nonae, 5th or 7th, depending on the length of the month), the Ides (Idūs, 13th or 15th), and the Kalends (Kalendae, 1st) of the following month. Thus the last day of Quintilis was the pridie Kalendas Sextilis, "day before the Kalends of Sextilis" (August). Roman counting was inclusive; July 5 was ante diem III Nonas Quintilis, "the 3rd day before the Nones (7th) of Quintilis," usually abbreviated a.d. III Non. Quint. (or with the a.d. omitted altogether); July 23 was X. Kal. Sext., "the 10th day before the Kalends of Sextilis." Each day was marked with a letter such as F for dies fasti, days when it was legal to initiate action in the courts of civil law; C, for dies comitalis, a day on which the Roman people could hold assemblies (comitia), elections, and certain kinds of judicial proceedings; N for dies nefasti, when these political activities and the administration of justice were prohibited; or NP, the meaning of which remains elusive, but which marked feriae, public holidays. Days were also marked with nundinal letters in cycles of A B C D E F G H, to mark the "market week" A dies natalis was an anniversary such as a temple founding or rededication, sometimes thought of as the "birthday" of a deity. On a dies religiosus, individuals were not to undertake any new activity, nor do anything other than tend to the most basic necessities. During the Imperial period, some of the traditional festivals localized at Rome became less important, and the birthdays and anniversaries of the emperor and his family gained prominence as Roman holidays. On the calendar of military religious observances known as the Feriale Duranum, sacrifices pertaining to Imperial cult outnumber the older festivals. After the latter 1st century AD, a number of dates are added to calendars for spectacles and games (ludi) held in honor of various deities in the venue called a "circus" (ludi circenses). 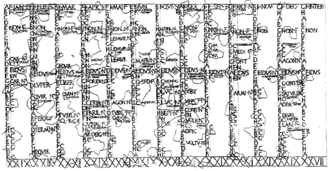 By the late 2nd century AD, extant calendars no longer show days marked with letters (F, N, C and so on) to show their religious status, probably in part as a result of calendar reforms undertaken by Marcus Aurelius. Unless otherwise noted, the dating and observances on the following table are from H.H. Scullard, Festivals and Ceremonies of the Roman Republic (Cornell University Press, 1981), pp. 158–169. Month names: Martius, Aprilis, Maius, Junius, Sextilis, September, October, November, December. Leap month: Mercedonius or Intercalaris. ^ H.H. Scullard, Festivals and Ceremonies of the Roman Republic (Cornell University Press, 1981), p. 158; Bonnie Blackburn and Leofranc Holford-Strevens, The Oxford Companion to the Year (Oxford University Press, 1999), p. 669. ^ a b "Los Cielos de Agosto" (Spanish: "The Skies of August"), Jorge R. Ianiszewski, Circulo Astronomico, 2006, webpage: CirA-Agosto. ^ Scullard, Festivals and Ceremonies of the Roman Republic, p. 158. ^ The month name is construed as an adjective modifying Kalendae, Nonae or Idũs; as accusative plural, Sextilĩs might also be written as Sextilēs. ^ Scullard, Festivals and Ceremonies, pp. 44–45. ^ Michele Renee Salzman, On Roman Time: The Codex Calendar of 354 and the Rhythms of Urban Life in Late Antiquity (University of California Press, 1990), p. 118ff. ^ Salzman, On Roman Time, p. 17.